The original low-budget stock car formula, Modstox has absolutely thrived in the last few seasons and is the ideal choice for the newcomer to contact oval racing. With cars simple in construction and powered by 850cc engines the formula is inexpensive and huge fun for drivers and supporters alike, with some of the biggest grids in its considerable history being seen at Birmingham last year. The bumpers on the machines are not just for decoration either, and some push and shove action worthy of BriSCA stock car racing can often be enjoyed. 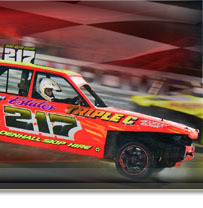 This really is one formula on the up – if you’ve ever wanted to become a stock car star, this is the perfect place to start out.